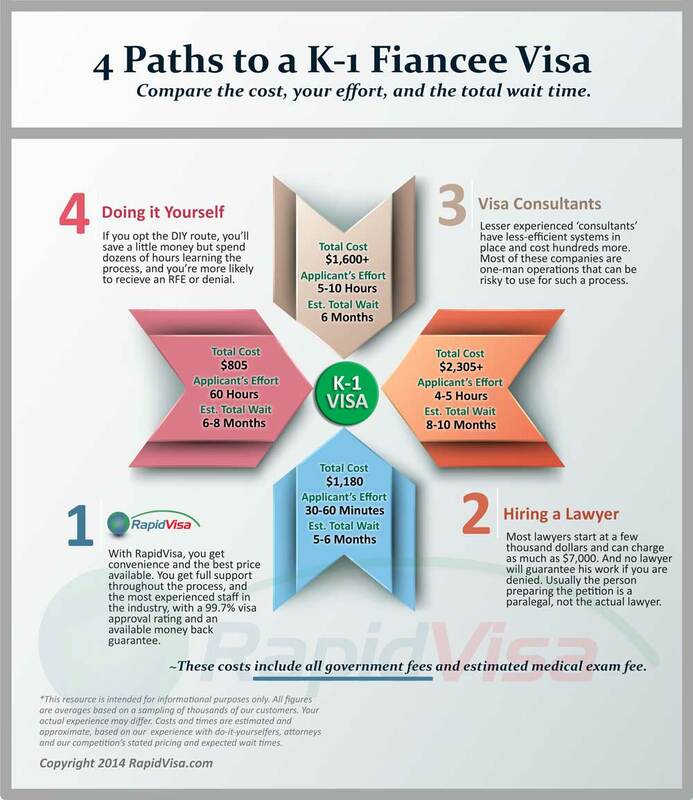 Let’s look at 4 different paths to a K-1 fiance visa. Which one you choose will depend on how much time, money and risk you are willing to put into the decision. The important thing is to take into consideration all of these when deciding. Of course we’re a little biased here. It’s us. But there are some definite benefits to choosing this route. Firstly, the amount of time and risk it saves you are invaluable. As far as your time involved, we’ve streamlined our systems to intake data efficiently via our simple questionnaires. We do all the heavy lifting. We also speed up the overall process because we don’t slow it down. We’re not knocking lawyers. In fact, we have our own, and in some cases, an attorney is exactly what you need. But in most cases, when you hire an attorney, they aren’t even the one doing the work for you. Their paralegal is, which is fine, but not always worth the cost. Also, many immigration attorneys spend so much time on a single case (because they charge so much), that they only perform a few of each visa type per year. Also, passing paperwork back and forth the old fashioned way takes much longer than an online system, adding a month or more to the process. This category would classify as the closest thing RapidVisa has as “competition”. Many of these are a viable option, although they are not as experienced as RV, and nobody comes close to our prices. In some cases, these are one-man operations from individuals who did the process themselves and thought they’d help others do the same. Many of them don’t have a business license, insurance or an office, let alone a BBB rating. Always avoid companies claiming to sell forms that are available free at the USCIS website! Doing it yourself is an option many people choose. It certainly is possible to navigate through this process on your own. In fact, there are several well established self-help forums out there that can give you insight. However, be prepared for a solid learning curve that can take from 40 to 60 hours to completely get a handle on. This is something you’re probably going to do once in your life. Is it worth the time involved to learn all this to save $375? Doing it yourself also puts you at risk for delays due to RFE and denial.